The indictment supersedes existing charges and avoids the need for a preliminary hearing. Tersargyan once served in the Armenian army and fancied himself "a professional killer," detectives said. He became a suspect in the slayings after police received a tip from his employer. Police and prosecutors claim Tersargyan killed Hakobyan's husband and child after becoming obsessed with her. 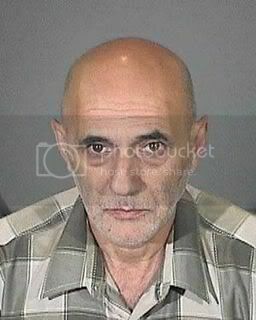 Tersargyan and his wife became close friends of Hakobyan's family almost immediately after they arrived in the country in 2003 and moved to Little Armenia on the eastern edges of Hollywood, police say. Safaryan had confided in Tersargyan that he was having an affair with an old girlfriend he had known in Armenia, said LAPD Det. Mike Whale. By then, Tersargyan had fallen in love with Hakobyan and tried to drive the couple apart by helping Safaryan arrange his trysts while also telling Hakobyan details about the affair, detectives said. Hakobyan remained in the marriage, which appears to have angered Tersargyan and led him to more drastic measures, detectives said. Safaryan received an anonymous threat that he should leave the country quickly, which detectives said they now believe was an attempt by Tersargyan to scare the man off. Within days of the threat, Safaryan and his daughter were dead. During the investigation into those killings, Tersargyan fed detectives details about the affair, which helped to turn suspicion on the mistress and her husband. In the months after the slayings, Tersargyan continued to pursue Hakobyan without success. Police believe the constant rebuffs ultimately drove him to kill her, as well. Suspicion first fell on Tersargyan when his boss at a cabinet-making company called an Armenian American police officer he knew in the Glendale Police Department with concerns about one of his workers. He told the officer that he had seen Tersargyan with a handgun and had talked of his close relationship with the Safaryan family. After his arrest, ballistics tests on a gun he owned showed it had been used to fire the bullets that killed Hakobyan, Whalen said. While searching Tersargyan's residence police found a beat-up gray van that they connected to the killing of prostitute Julie Kates. Kates had been standing alone at a bus stop in daylight on the corner of Sunset Boulevard and Kingsley Drive when she suddenly fell to the ground. When she was taken to a hospital, doctors discovered she had been shot in the temple with a small-caliber weapon. An acquaintance of Kates told detective that a man driving an old gray van had angrily accused Kates of stealing a DVD player the day before she was killed and threatened to harm her if she did not return it. The prosecution announced Wednesday that it will seek the death penalty against a man indicted last year on charges that he murdered four people, including an 8-year-old girl and her parents. Alberd Tersargsyan, 65, is charged with the Dec. 11, 2008, murders of Khachik Safaryan and his daughter, Lusine; the March 11, 2010, sniper-style shooting of Julie Kates; and the March 26, 2010, slaying of Safaryan's wife, Karine Hokobyan. The indictment includes the special circumstance allegations that the four victims were murdered by means of lying in wait, that Lusine Safaryan was a witness to a crime who was intentionally killed for the purpose of preventing her testimony in a criminal proceeding and multiple murders. Safaryan and his daughter were found dead in the 1200 block of Tamarind Avenue in Hollywood by the couple's then-12-year-old daughter when she came home from school. That girl also later found her mother's body slumped in the driver's seat of her Honda SUV in the 5800 block of Lexington Avenue and was taken into protective custody. He was initially charged in April 2010 with Hakobyan's murder, with prosecutors adding the three additional murders in August 2010. During today's hearing, Los Angeles Superior Court Judge George G. Lomeli refused to allow Tersargsyan to act as his own attorney because the defendant refused to complete a written waiver involving his right to legal counsel. Tersargsyan remains jailed without bail. He is due back in court for a pretrial hearing July 9. Tersargsyan commited suicide on the 1st of April 2018.